Ah, the yoga myths. No, I’m not talking about ancient tales featuring epic battles and powerful deities. I mean the common misconceptions prevalent throughout contemporary yoga culture, as well as the fallacies and stereotypes held by the general populace in regard to what yoga is and who yoga is for. These are the clichés we hear off-handedly repeated in asana class (“We’re sweating out toxins!”) and comments uttered by acquaintances upon learning of our enthusiasm for practice (“Oh, I’m not ______ enough for yoga”). No, I’m not talking about ancient tales featuring epic battles and powerful deities. And you might wonder, why does it matter? Is it really a big deal if somebody thinks going to yoga means 90 minutes of trying to get your foot behind your head, or that it's possible to wring out your liver like a wet dish towel? (Spoiler alert: it's not.) To risk another cliché, “Knowledge is power.” And when we drop preconceived notions about what yoga should do and what a yoga practitioner should be, we can start to take ownership of our practice. That’s when the focus shifts from trying to become someone else to becoming ourselves more fully. It’s when yoga transforms from a set of standards we can’t possibly reach to a real and tangible source of inspiration and empowerment. And that’s when the real magic takes place. Without further ado, here are a few of the most pervasive yet utterly incorrect assumptions about yoga. 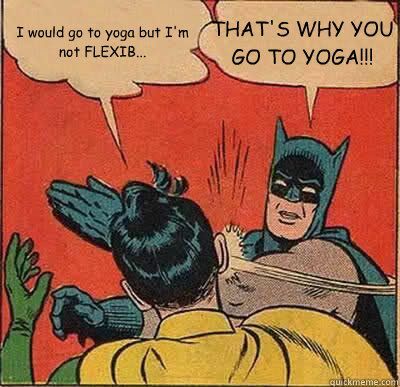 Okay, I know, the Caped Crusader isn’t exactly promoting ahimsa here, but he does make a good point, right? Like, obviously, if you feel like you’re lacking in the flexibility department, stretching is a good idea. But really, there’s more to it than that. The whole “I’m not flexible enough for yoga” thing is problematic because it’s rooted in the assumption that those we typically perceive as flexible are naturally better at or more suited to yoga. And okay, if you’re more on the bendy side, you might have an easier time touching the floor in uttanasana or getting your heels to the floor in down dog; but especially in the beginning, extreme bendy-ness (hypermobility) can often turn out to be more of a liability than an asset. It increases the risk of joint instability and injury because you’re more likely to take the stretch in your ligaments, which aren’t really designed for stretching. (I highly recommend checking out Jenni Rawlings’ excellent article on the difference between hypermobility and flexibility to learn more about the biomechanics.) This is why it’s so important for new students, pregnant students (pregnancy hormones already make the ligaments more lax), and those who are naturally more stretchy to prioritize stability over flexibility. Okay, I know, the Caped Crusader isn’t exactly promoting ahimsa here, but he does make a good point, right? Also keep in mind that yoga isn’t just about flexibility. There’s a major strength component at play too. Just think of lunges, standing poses, and planks, for example. When practiced safely, asanas like these both build and require an enormous amount of strength. Bottom line? Whether super-stretchy or stiff as a board, we all have poses that we feel “good at” in the beginning and poses that provide much more of a challenge. Practice yoga long enough and you’re bound to encounter the “dishcloth analogy”—”Twists are like wringing out a dirty dishcloth!” In case you’re not familiar with it, in this scenario the dishcloth represents your internal organs, the wringing represents the twisting action, and the dirty dishwater and residue you wring out represents various toxins you’ve accumulated over time. And certainly, an oft-repeated “benefit” of twisting postures is that they’re cleansing or detoxifying for the internal organs—the liver in particular. But here’s the thing: Your liver is not a dirty dishrag. It’s a liver. And it has its own natural detox process, which is LARGELY a cellular process. This doesn’t mean spinal twists are utterly useless as far as your organs are concerned, though. While you can’t negate excess jello shots with a few extra ardha matsyendrasanas the next morning, twists are still an important part of a balanced practice and they do improve circulation, which is quite beneficial to your internal organs. But you’re not actually “squeezing out” your liver every time you do parivritta trikonasana. Unfortunately, you can’t just sweat away those menacing toxins either—not directly anyway. This doesn’t mean working up a sweat is a waste of your time, though. While class temperatures hovering around the hundred degree mark or higher are an acquired taste (and not appropriate for everyone), exercise that’s vigorous enough to make you sweat definitely has its benefits. Again, that whole circulation thing, for one, along with all of the other benefits that come with vigorous exercise, because, well, it’s vigorous exercise. But if the puddles of sweat on your yoga mat aren’t the aftermath of a mass exodus of toxins, what’s actually going on with your body anyway? You might recall learning in biology class that you have different types of sweat glands, the two main types being eccrine glands and apocrine glands. Apocrine sweat glands are located in concentrated areas of the body (like your armpits and groin). They’re activated when we’re stressed (hence those annoying armpit stains you discover after a public speaking stint), and secrete sweat that’s mainly comprised of water and fat (and tends to produce a noticeable odor once it comes in contact with the bacteria on your skin). But if the puddles of sweat on your yoga mat aren’t the aftermath of a mass exodus of toxins, what’s actually going on with your body anyway? Eccrine sweat glands, on the other hand, are found throughout your body and are activated when body temperature rises (like during a hot class). They secrete sweat that’s mainly made up of water and salt. And that’s what’s actually exiting your body when you work up a sweat in yoga—water and salt. The purpose of eccrine gland sweat is to help regulate your body temperature, not unload toxins. A person’s BMI, or body fat percentage, is not an indicator of how frequent or advanced their practice is.